Rolls-Royce, Bentley and even Lamborghini are making SUVs. The fastest road cars in the world are hybrids. Automated manual transmissions are revolutionising urban transport after having failed all those years. The automotive industry today has conditioned us journalists to expect the unexpected. But when Ford says it's marrying it's EcoBoost engine to the most loved car since the Model A - the Mustang, well, it generates the Lady Diana-Prince Charles nuptials kind of attention. And before the smart alecs among you point out that this isn't the first time that a four-cylinder engine with forced induction has powered a Mustang - yes, Ford did run four-cylinder Mustangs from 1974 to 1993, and the SVO models from 1984 to 1986 also featured turbocharging - but there is a rather big difference. Those models were introduced as cheaper alternatives to the V6s and the mighty V8s, and catered to those who didn't mind compromising on performance. The EcoBoost technology isn't the country cousin. In fact the four-cylinder Mustang EcoBoost is about $1500 more expensive than the V6 in the US (in India too, the Ford EcoSport with the 1-litre EcoBoost is pricier than the 1.5-litre naturally aspirated engine). So what is the point of it? Do you simply dole out more money to skimp on running costs or feel good about doing your bit for the planet? No, and this needs elaboration. Turbocharging helps smaller capacity engines match the performance of the bigger naturally aspirated engine, or in the case of the Mustang (and the EcoSport), better it. The Mustang EcoBoost makes 10PS more power and more importantly 40Nm more torque while doing about 11 kilometres to the litre. As a result, the EcoBoost is also quicker to a 100 (5.6 seconds) than the V6, but here's where driving my first Mustang felt nothing like what years of reading about it had conditioned my brain to expect. That animal thrill, that pregnant fear of unleashing a beast, is pronounced by the absence of the V6. The heavy use of electronic driver aids lends it an uncanny composition and the drivetrain feels so smooth that you could very well be driving an everyday sedan. There is no growling and roaring, only timid polite sounds from the spooling turbocharger and the wastegates, and a slight nonchalant direct injection clatter. The steering has selectable modes for servo assistance. Even the interiors carry an almost European chic with a leather wrapped dashboard and steering, some clever storage spaces and even a big boot. This wasn't the Mustang I'd spent countless sleepless nights drooling over. But do I want my money back? No. Not because I got what I expected from a Mustang but because of the unexpected elements in my experience. Mustangs, as all the other muscle cars, have always been ridiculed for their handling and their tendency to understeer at all times, thanks to the weight of the big V6s and V8s up front. The smaller 2.3-litre in-line four-cylinder engine is lighter than the V6 and the V8, allowing Ford to balance the weight better between the front and rear axles. Add to this the fact that the 2015 S550 Ford Mustang also gets revised front MacPherson Struts and for the first time, an all new stock independent rear suspension (if you exclude the souped-up 99-04 SVT Cobra Mustang), and you have a car that colours your perspective of Mustangs. I can't comment on the ride quality since I was on a test track but the Mustang now feels and handles like a modern day sportscar. 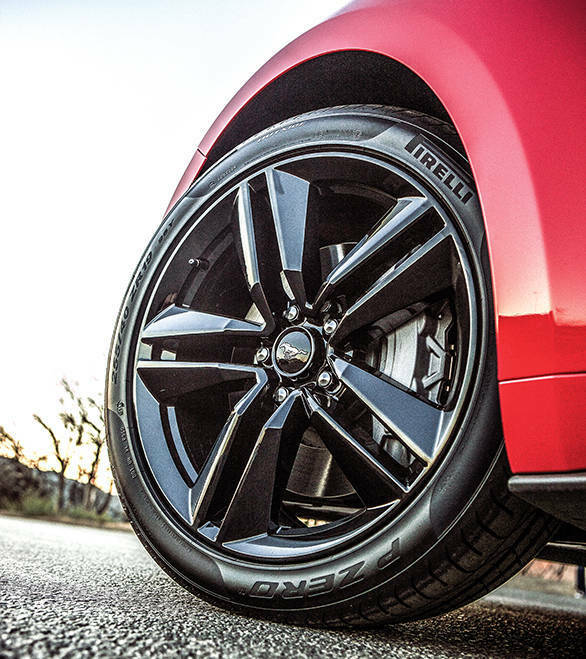 Not only is there significantly less body roll, the nose dive (something that Mustangs were notorious for) when you worked those optional 14-inch quadruple front brake callipers and the 13-inch single rear callipers hard, has also reduced considerably. It's times like these you wonder if a car ought to be called an evolution or all-new. But doing an all-new Mustang can be quite a risky proposition. Rebuilding an icon involves deference to the legend and fear-driven caution as well - you really don't want to screw it all up. 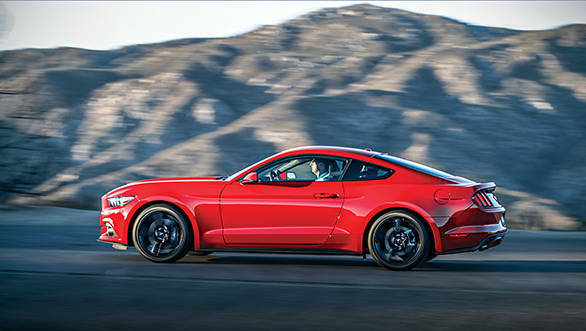 It is once you look at the 2015 Mustang's design carefully that you appreciate the thought and effort put into it. It began as a clean slate, with no prior brief, but everyone knew what was expected of the new generation Mustang. What was conceived was only a recognisable modern version that carried a lot of the 50-year heritage. 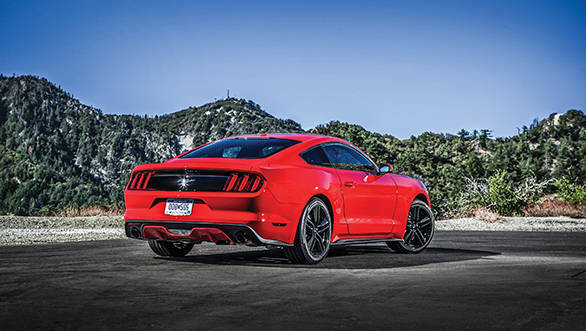 The long hood in the front that can house both a massive V8 and a relatively tiny turbo in-line four, the selfish cabin that almost sits on the rear axle, the aeronautics inspired switchgear inside  are all reminiscent of the Mustang ethos. What I also love is that the designers have gone back to the fastback shape of the first generation Mustang, and they've included design cues from the famous '64, '67 and '69 Mustangs like the triple block tail lights and the trench across the side. The HID headlamps, the grille and the 'shark's bite' front end, on the other hand, look heavily inspired from the 2011 Ford Evo concepts. The sequential side indicators, much like the ones on the Audi A8, are a nice touch. The designers have gotten rid of the body coloured pillar from the previous generation but the thick C-pillar still serves as a massive blind spot. Thankfully that is addressed in the 2015 Mustang with a blind spot monitor. There are a few nice touches to the interiors as well - the speedometer has a caption that reads 'ground speed' while a boost gauge reminds you that there's more air intake than usual. 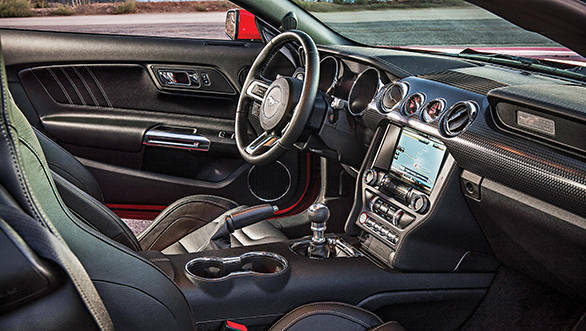 The criticism for the old Mustang's steering position and size has also been addressed with a more ergonomic detail. The final product is something that Ford can be proud of and Mustang fanatics will be very happy with. 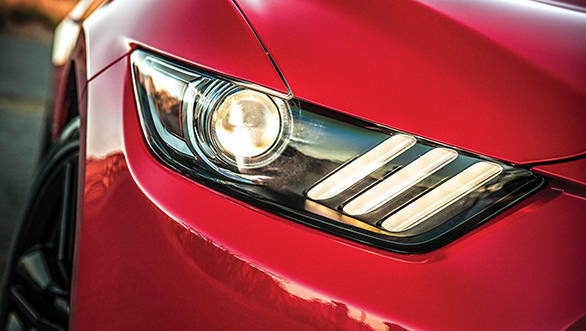 In fact, Indians too can feel a tinge of pride as two forces behind the Mustang's conception are of Indian origin - Prakash Patel, the product manager, and Raj Nair, the chief of product development for the 2015 Mustang. Now we've all read about how the new gen Mustang is going to be a global product which means it will be shipped to right-hand drive markets as well. Finally, we might get to see a sold-off-the-shelf Mustang on Indian roads. Now, the EcoBoost might not at first seem like the right choice of engine for a market like India  an assumption based on the fact that the Mustang EcoBoost is more expensive than the naturally aspirated V6 and is significantly less powerful than the 5-litre V8. But I'm convinced that Ford should still bring the EcoBoost Mustang to India. And that is because the right question hasn't been asked yet. 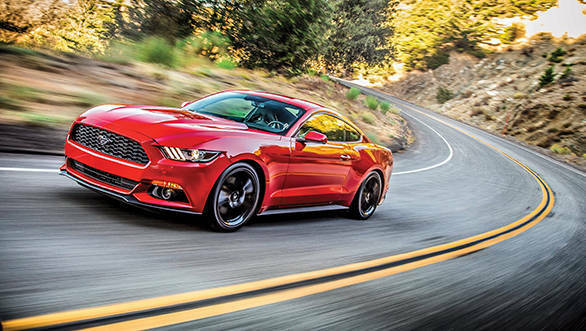 The real debate isn't whether the EcoBoost would be a successful option for the Mustang in India. 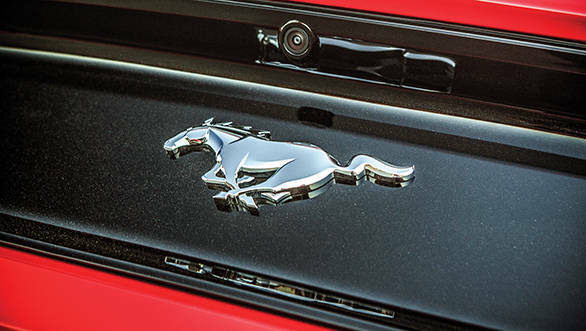 The Mustang is a halo car to begin with  it's not meant to be a runaway success. The real hero of the story is the EcoBoost engine itself. Turbocharging downsized engines is a reality we're all going to have to accept in the near future. So the right question is  should Ford be haloing the EcoBoost technology with the Mustang rather than the cars in its portfolio? And the answer is an emphatic yes! Future Fords are likely to increasingly feature EcoBoost technologies and for that purpose Ford should absolutely ship the EcoBoost-ed Mustang to our shores. When that happens, you can be certain that India will have its harnesses and bridles at hand.